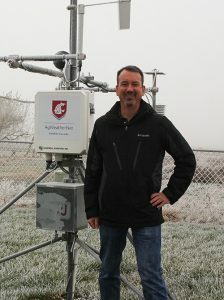 Visiting an automated weather station at Prosser, Wash., David Brown, new director of WSU’s AgWeatherNet, will lead efforts to enhance the weather station network for growers and scientists (WSU Photo-Karen Kniep Blanton). Helping growers and all Washingtonians understand and prepare for the challenges and changes that weather brings, Washington State University soil scientist David Brown is the new director of AgWeatherNet, Washington’s Agricultural Weather Network. Brown, associate professor in the Department of Crop and Soil Sciences, began his new role on Nov. 16, 2018, replacing director Gary Grove, who stepped down Nov. 1. A scientist at WSU for nearly 12 years, Brown brings statistical methods to the study of soil and crop sensing, soil biogeochemistry, and precision agriculture. His work helps people grow crops more sustainably while preserving our natural resources. A Fulbright Scholar, National Science Foundation Graduate Research Fellow, and Peace Corps high school teacher in Fiji, Brown earned his doctorate in soil science at the University of Wisconsin-Madison. As incoming director, Brown will oversee all aspects of the 30-year-old AgWeatherNet, one of the largest and best automated agricultural weather station networks in North America, enhancing its use as a research tool for scientists and extension tool for faculty and industry. “We are confident that our industry and research partners will benefit from David’s leadership skills,” said André-Denis Wright, Dean of the College of Agricultural, Human, and Natural Resource Sciences (CAHNRS). Brown adds considerable experience to AgWeatherNet in project and program leadership, agricultural research, data analytics, and environmental sensing. He also has extensive knowledge of soil moisture sensors and distributed sensor networks. Dean Wright thanked Dr. Grove for leading AgWeatherNet for the past three years. “All of CAHNRS appreciates the time and dedication Gary has provided to this critical unit in advancing our service to the state’s agriculture industries and faculty research efforts,” he said. At sites across Washington, WSU researchers have been recording weather data daily for more than 100 years. Installing its first station in 1988, AgWeatherNet today brings together data from 176 automated stations, providing growers and residents with forecasts, crop and disease models, and many other decision-making tools. Standard AgWeatherNet weather variables include air temperature, relative humidity, dew point temperature, soil temperature at 8 inches, rainfall, wind speed, wind direction, solar radiation and leaf wetness. Variables are recorded every five seconds and summarized every 15 minutes, providing a running record of weather that affects Washington agriculture. Learn more about AgWeatherNet here.